Since not all relational database systems support JSON types, Hibernate does not come with a built-in JSON Type mapper. Traditionally, all custom types have been supplied via a UserType implementation. However, a UserType is not very developer friendly so, in this post, I’m going to show how you can do a better job using AbstractSingleColumnStandardBasicType instead. 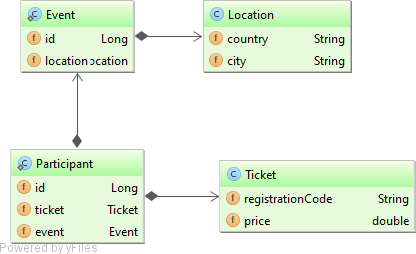 Location and Ticket are JSON Object(s), while Event and Participant are JPA entities. Our goal is to provide a Hibernate JSON Type that works for any type of JSON Java Object and on any relational database that supports JSON columns. For more info, check out the hibernate-types open-source project. throw new IllegalArgumentException("The given string value: "
throw new IllegalArgumentException("The given Json object value: "
For this reason, we are going to implement two types: JsonBinaryType and JsonStringType. Both types extend the AbstractSingleColumnStandardBasicType Hibernate built-in Type base class and any JSON Object is accepted. By implementing the DynamicParameterizedType interface, we can extract the underlying JSON Object Java Class, which is needed when reconstructing the JSON Object from its String representation. Both JsonBinaryType and JsonStringType use the same JsonTypeDescriptor which is responsible for transforming the JSON Object type used in the entity mapping classes to a format that is supported by the underlying database. The jsonObjectClass holds the underlying entity mapping JSON Object type. The toString and fromString methods allow Hibernate to converts a JSON Object to a String and to reconstruct a JSON Object from its String representation. The unwrap method is used prior to materializing the JSON Object to a format that is expected by the currently used relational database. For this reason, we can unwrap a JSON Object to either a String or a JsonNode. The MutableMutabilityPlan specifies that the JSON Object can be updated, and the areEqual method determines if two JSON Object(s) are equivalent. The AbstractJsonSqlTypeDescriptor base class allows us to notify Hibernate that the expected JDBC type is not a SQL-standard column type, as well as the ResultSet extraction logic. As you can see, the JSON Object is sent as a JsonNode using the setObject method exposed by either PreparedStatement or CallableStatement. As you can see, the JSON Object is sent as a String using the setString method exposed by either PreparedStatement or CallableStatement. The `TypeDef` annotations can be applied to a base entity class or in the package-info.java file associated to our current entities package. MySQL 5.7 adds support for JSON types which, at the JDBC level, need to be materialized as String. For this reason we are going to use JsonStringType. The JSON Object(s) are properly materialized into their associated database columns. Both PostgreSQL JSON types need to be materialized using a binary data format, so we need to use the JsonBinaryType this time. The generic JSON Types(s) are very useful when you need to map any JSON Object to either a String or a binary database representation. Hello Vlad, appreciate your articles! How can I convert a @Procedure parameter (a JsonNode entity) to JsonBinaryType in order to use it with @Param? I want to supply a jsonb field as input to a stored procedure this way, but I have a problem with passing it to the DB, since I can not use @Type with method parameters. That’s a Spring annotation, so you need to ask the Spring team how they support custom Hibernate Types. Send me a replicating test case to the hibernate-types project using a Pull Request and I will take a look at it. Have any way to use @Type(type = “json”) with a Map<>? Use the @Type(type = "jsonb") and it should work. Hi, Could you please provide jar for dependency java class. eg. AbstractTest. I was trying to call method doInJPA from dao class but unable to access. I already have entity manager object in my dao class. please advice how can I manage and call the doInJPA method for insert , update delete. That’s only intended for testing. It makes no sense in a DAO since you would need to share the same EntityManager between all DAOs called within the same service method. I use MySql with Hibernate 5.2.11-Final. On database I created a column varchar(4000) to manage the JSON object. When I try to persist my entity I get NullPointerException in JsonTypeDescriptor.toString(JsonTypeDescriptor.java:83) because the objectMapperWrapper variable is null. In the GitHub repository you can find plenty of examples that work just a charm. Just compare mine with your configuration and see where they differ. Thanks for the excellent post. I have used this dependency in my project. I am using postgres db with spring-data-jpa in a spring-boot application. Insert works like a charm. But I am facing issue with querying table based jsonb column. The query used it as below. This article explains how to fix that issue. Enjoy reading it! How to prevent the name of the property from being included in json? Try adding @JsonIgnore to the property that you don’t want to save in the DB. In controller class, when I am retrieving all data of Projects, this column is also getting retrieved but I am not able to display it. If you can persist and fetch the JSON field, then everything works fine from the Hibernate part. You have an issue in the web layer, which beyond the scope of this article. Thanks for the article. I tried to use this with JPA auto generate in my spring boot (with hibernate-types-52), it didn’t work, got an error. Does it work with only predefined schema? All the tests in the GitHub repository use user-generated schema and they work like a charm. Most likely, you didn’t register the JSON Type you are using as explained in the articles mentioned in the GitHub repository page. I’m trying to store a JsonNode Jackson data type in an Oracle database as data type BLOB. Is this possible with a small modification to your library? I notice that compatibility is only mentioned with MySQL and PostgreSQL. Try either “jsonb” or “json” types and see how they work with Oracle. If they don’t work, try to build an Oracle-specific type based on the existing ones and send me a Pull Request. or am mixing things up? Yes, try one or the other. Have tested with Oracle. If your data type is set to CLOB (one of the other supported JSON types) then type=”json” works. Oracle gives the error: Invalid HEX number if the column type is BLOB – I assume this is because it’s trying to insert a string into a binary column. I think you need to use a CLOB, not a BLOB. Very informative post. However, using your JsonBinarytype, how can you cater to the Collection of Json types? Does the type needs to be changed? Check out this article for more details. Very nice and informational post. I followed your method to make a custom type X which can be mapped to VARCHAR. So my SqlTypeDescriptor.getSqlType() return VARCHAR. Also my type descriptor class does not implement DynamicParameterizedType. Am I correct? Hiberate tries to make tables with fields of type X and obviously it fails in Postgre. Do you have any hint on this? That’s not a valid example. What exactly is “x” everywhere in your code? Just follow these examples on GitHub to get a better understanding of what you can map with this library. Yes. I get it wrong. After changing columnDefinition to VARCHAR, everything works as expected. X is a custom class which I want store as VARCHAR in DB but I want have custom properties on it so I defined a custom type. You’re welcome. I’m glad I could help. Hi Vlad, thanks for the hibernate-types project. It works like magic. I was reading this blog article trying to understand how the custom types work without defining a custom hibernate dialect registering custom column types. I found other articles around about jsonb type they all need custom dialect with registered types. Which piece of the code shown in this article makes custom dialect unnecessary? You only need that for native queries and some dialect already register JSON object type. That was the key! After you mentioned that, I dug down into hibernate builtin dialects and found that, specifically PostgreSQL92Dialect introduces the “json” type registration. What if the bean to serialize/deserialize to JSON/JSONB contains LocalDate and/or LocalDateTime fields (java.time) and a custom datetime format is needed like for example “yyMMdd”? Then you can use a custom ObjectMapper as explained in this article.